Blu release of the final film of Hitchcock's early British period. The number of Hitchcock movies that could be described as a slog can be counted on one hand, but Jamaica Inn is a member of that small group. Hitchcock completists should of course give it a chance, and should you choose to do so, this gorgeous new 4K restoration is the way to go. There are some who dismiss Alfred Hitchcock's early British films, as though he really only came into his own upon arriving in Hollywood and gaining access to "the world's greatest train set". The truth is, some of Hitch's finest filmmaking can be found in the early work produced in his homeland, in masterpieces like The 39 Steps, Young and Innocent and The Lady Vanishes. This is largely because as a director, Hitch was given a high degree of freedom to experiment with his visual storytelling, a luxury he temporarily lost on his initial arrival in Hollywood, where he found himself constrained by the studio system. Of course, he managed to deliver gems like Rebecca, Foreign Correspondent and Saboteur, but they lack much of the visual audacity of his British work. Before leaving Blighty, Hitchcock directed an adaptation of Daphne du Maurier's Jamaica Inn (he would return to du Maurier for 1940's Rebecca and 1963's The Birds). As if to prove to the Hollywood studio heads that he was capable of delivering a film devoid of the sort of visual tricks they might balk at, Hitchcock shot the movie in the most perfunctory fashion imaginable. Save for a brutal opening sequence that plays like the 1939 equivalent of Saving Private Ryan's beach landing set-piece, Jamaica Inn is rendered in a dull series of close-ups and medium shots, and is arguably the talkiest movie the director ever made. In her debut performance, Maureen O'Hara plays Mary Yellan, a young Irish woman who lands in the lawless Cornwall of 1819 to stay with her aunt at the titular hostelry. Upon arrival she discovers the Inn serves as the hideout for a gang of murderous criminals who specialise in causing ships to run aground so they can pilfer their cargo and slaughter the crew, as depicted in that grim opening sequence. Jamaica Inn's greatest strength is its cast. O'Hara is luminescent in an instant star-making turn, backed up by a supporting cast of some of the best British thesps of the time, including Basil Radford, Leslie Banks and Mervyn Johns. It's the great Charles Laughton who commands most attention as the portly local squire, Sir Humphrey Pengallan, a potentially memorable character let down by an uninspired script that fails to make the most of Laughton's distinctive talents. The number of Hitchcock movies that could be described as a slog can be counted on one hand, but Jamaica Inn is a member of that small group. Hitchcock completists should of course give it a chance, and should you choose to do so, this gorgeous new 4K digital restoration courtesy of the Cohen Film Collection and the BFI is the way to go. Audio commentary by film critic Jeremy Arnold, a visual essay by Hitchcock expert Donald Spoto, trailer and a collector's booklet on the first pressing only. Regardless of how you rate the film, the extras alone make it a worthy addition to Hitchcock fans' collections. 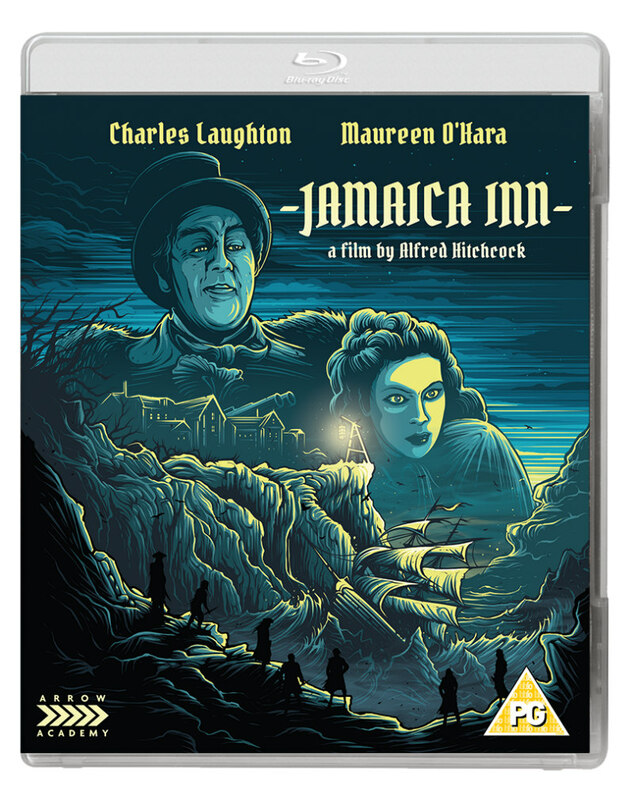 Jamaica Inn is available on blu-ray now from Arrow Academy.